Kwikset has been doing locks for a long time, and it’s got a new one that has folks talking: the Kevo. Kevo is a deadbolt that is smart enough to work with your smart devices to secure your home. Share ekeys (electronic keys) with other folks in your life so they can gain access to your home. 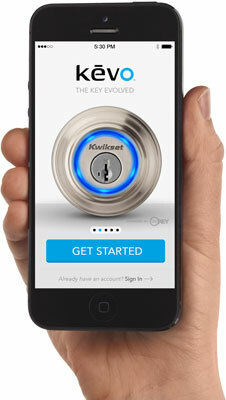 Use your smartphone or tablet to gain access to your lock: no key required. Key fobs can be used to gain access if you or someone you want to have access doesn’t have a supported smartphone. You can use a real honest-to-goodness physical key if you like. The Kevo app allows you to control your home’s access, view a history of folks who have come and gone, change ekeys, send ekeys, and more. Credit: Image courtesy of Spectrum Brands, Inc.
A colored light ring around the keyhole of the Kevo indicates when actions are taking place or when the system needs to alert you to something, such as low battery life. The Kevo support site includes a video, along with written details that explain the functionality of the lights and what the different colors mean. Kevo is pick-resistant and bump-proof. 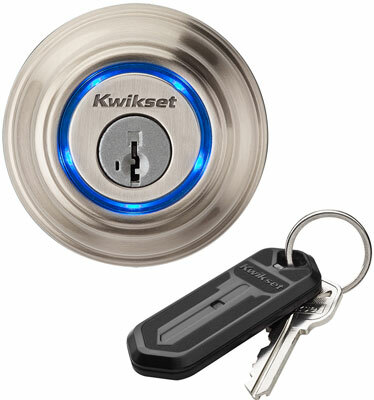 Kwikset’s SmartKey technology makes it easy for owners to rekey their own locks. Grant access to as many users as you can come up with, and grant different levels of access to them all on a case-by-case basis. Kevo’s Inside-Outside technology is a real boon, preventing anyone who is unauthorized to unlock the door when authorized users, with their phone or key fob on them, come into range on the inside of the door. In other words, if someone knocks on your door and you walk up to it while inside your home, your Kevo won’t automatically unlock for the person on the outside. You must calibrate your fobs and phones in order for this functionality to enable, but a little extra time when installing and setting up your Kevo is well worth it these days. Yes, you can use a key, but what about when you have a fob or an authorized phone? Simply walking within range of the Kevo, which you see along with a fob in the following figure, won’t lock or unlock the deadbolt. A user must first touch the lock with his or her finger, prompting the Kevo to look for authorized devices in the vicinity. Once Kevo recognizes an authorized user, the door unlocks or locks, as the case may be. Kevo is currently only supported through iOS devices, so if you have an Android device you will probably want to wait until Android devices support the Kwikset app.